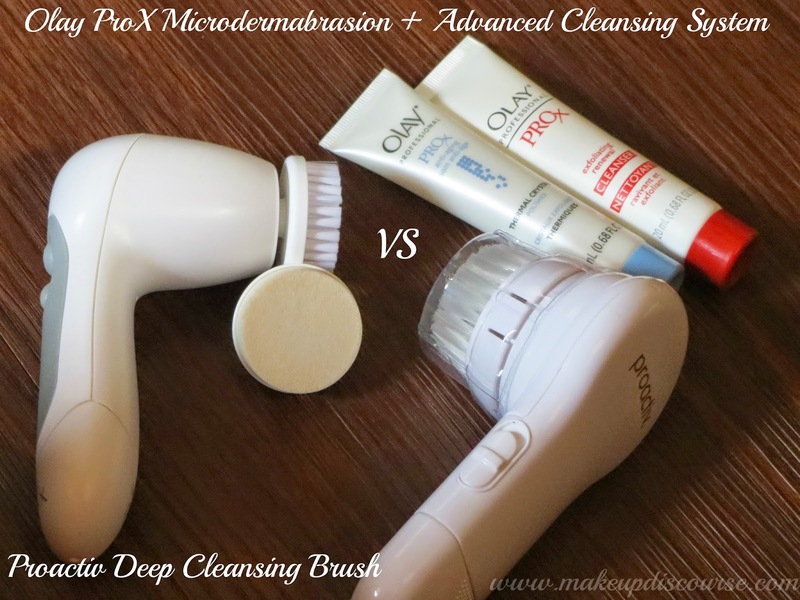 Review: Olay Prox Microdermabrasion + Advanced Cleansing System VS Proactiv Deep Cleansing Brush. The truth behind Cleansing brushes that I discovered lately. A usage history runs down in process of this review. 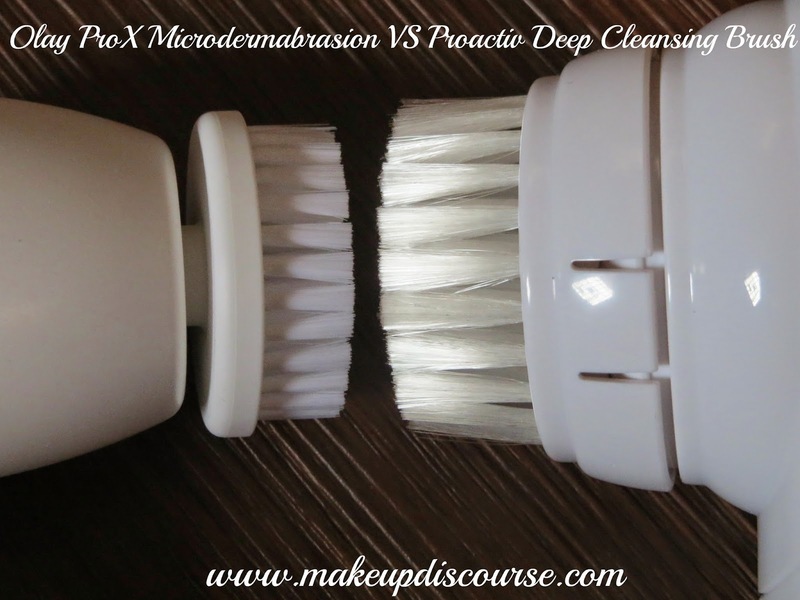 I have been wishful of Clarisonic Brush, the maintenance and 'purging' scared me. I have used a manual cleansing brush and some tools in the past. I have been electrified with the results on first usage of Olay ProX, my skin was smoother, softer and glowed on the forehead, nose and cheeks. Fortunately, I did not break out nor had a ‘purging’ phase. I clean my makeup with baby wipes and then use the brush with Neutrogena Deep clean. I do not run the brush on my face for more than a minute. I keep counting to 60 with moderate speed. My Facial oil gets absorbed better and my skin is clearer. But the best thing about using this brush is I don’t have a single clogged pore, whitehead or blackhead. I cannot be sure about white or blackhead since I never had them before. But my pores were clogged and gliding on moisturizer and getting the bumpy feeling to the fingers has just disappeared. The major issue lies in getting the replacement brush heads, for which I will have to wait. I came across Proactiv Deep Cleaning Brush on Amazon. And I ordered it for a backup till I could get the replacement brush heads. And to add to my amazement, Proactiv Deep Cleansing brush works equally good and comes with one more benefit. Do both the brushes rotate? 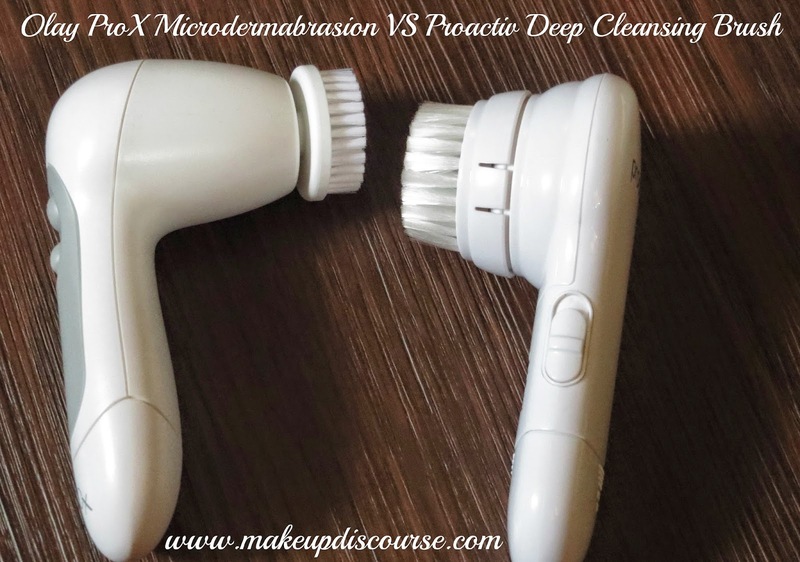 No, Olay ProX rotates and has three speeds: Daily Gentle Cleansing Speed, Daily Deep Cleansing Speed (which is I prefer using) and Microdermabrasion Speed. While Proactiv Deep Cleansing Brush vibrates and does not rotates. There is a new rotating version available as well which is not available here as per my knowledge. Since the Proactiv Brush does not rotate, I prefer holding it with light hand towards the target areas (clogged pores) and move slowly in circular motion. How does the texture of Brushes differ? 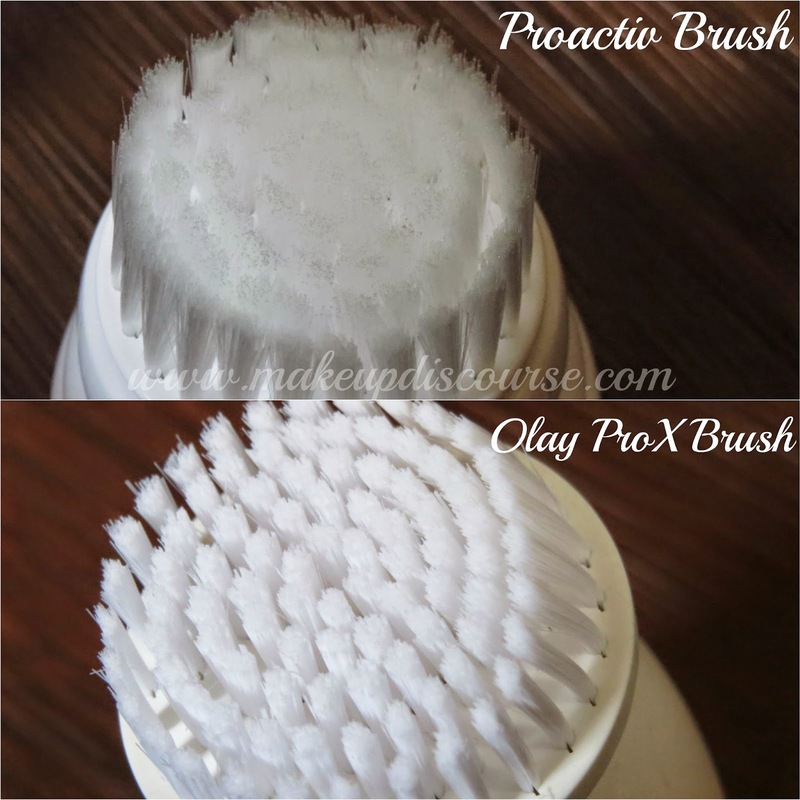 Olay ProX brush bristles are soft and short and opaque while Proactiv Deep cleansing brush bristles are longer, transparent and stiffer but equally gentle on sensitive skin. Both the brushes soften with contact of water. 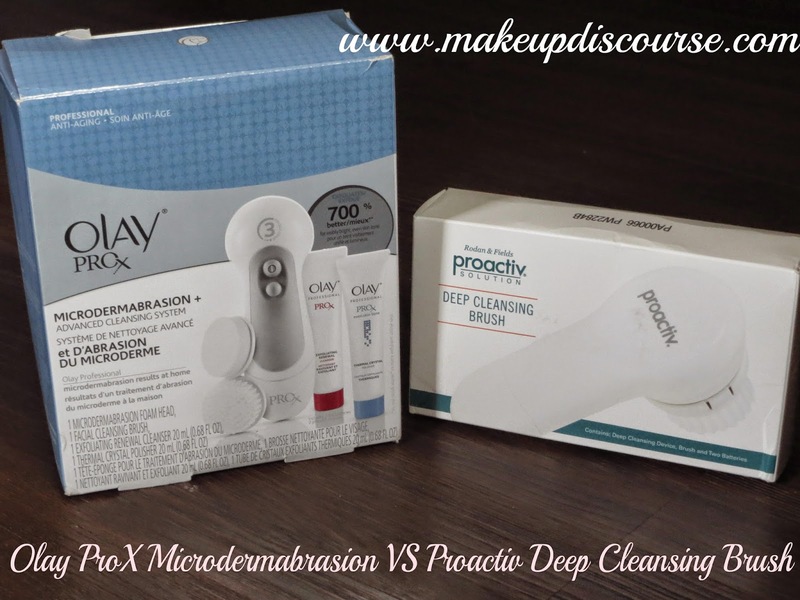 While Olay ProX comes with Microdemabrasion Head and with self heating Polisher and Renewal Cleanser, Proactiv does not come with any other attachment. But there is one great thing about Proactiv Brush, when removed the brush head. The surface is dome shaped and smooth and when turned on it vibrates. I use it as a facial massager, sometimes I massage in my moisturizer and sometimes Cleansing milk before taking off my makeup. Since it vibrates it helps the moisturizer absorb better and thus increases circulation. I would not count the so called ‘purging phase’ an issue here. I have sensitive skin, so much so that facial scrubs leave me red. Availability and replacing the brush head is an issue. The brush head would cost around $30 per year. I am not yet sure if I would get Foreo Luna (which is zero maintenance) or continue using Olay ProX & Proactiv Deep Cleansing brush. Eventhough Olay ProX is the clear winner with 3 speeds and two brush heads, availability would be a difficulty. If clogged pores is your concern, Proactiv with easy availability is the best covenant. Replacing the brush heads is definitely an issue but repurchasing the same brush for around 500 would not hurt much till one finds a better alternative. P.S. The Links are not affiliate not I am paid or compensated for review. Both the products have been bought by my own money.